There is a wonderful trend for outdoor living. People desire to bring the inside out and dine or relax in a lush, resort-like outdoor living room furnished with high-end all weather modern furniture, fashionable rugs, accessories, and sleek fireplaces or fire pits. Wouldn’t you want to escape to your own backyard and attain that ultimate feeling of comfort? I know I do! You can easily start creating your outdoor sanctuary with the right furniture, if nothing else. I recently discovered a UK company called Luxury Patio Furniture, under their parent company Paramount Zone Ltd, who takes extreme attention to detail on quality and design. Their intent is to craft luxury furniture at affordable prices. Their stunning contemporary outdoor furniture features handcrafted 100% eco-friendly rattan with comfortable Teflon coated cushions. James from Luxury Patio Furniture adds, “synthetic rattan has many advantages over traditional rattan. The main one being that it looks great year after year and requires hardly any maintenance at all. 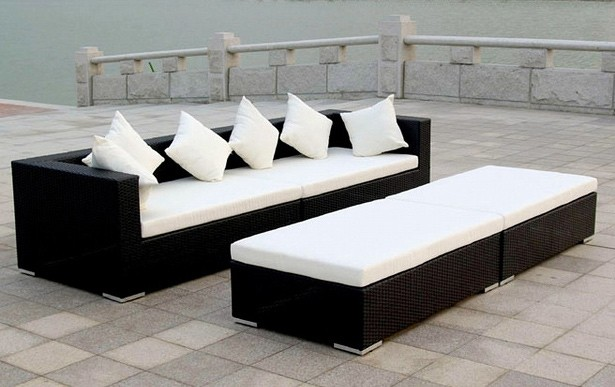 The Teflon cushions make the cushions very comfortable and long lasting.” Up close, the synthetic rattan design is beautifully finished and constructed and would add style and comfort to your outdoor space. Read on so you can learn more about all their products that are synonymous with complete and utter relaxation! 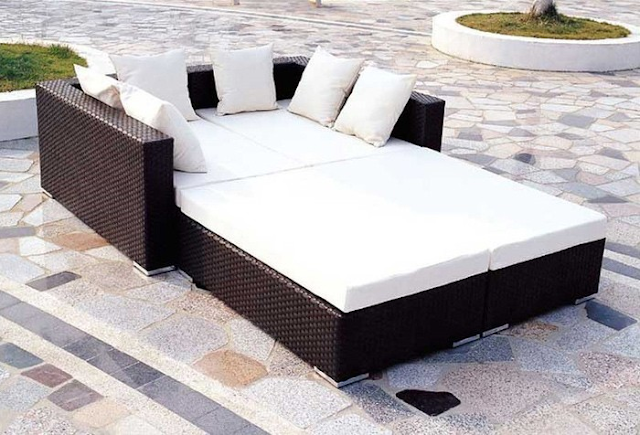 This Rattan Double Daybed looks so comfy and cozy for a night under the stars! Ahhh! The set comes with two ottomans and is extremely versatile allowing for a wide variety of seating arrangements. The Rattan Sun Lounger is not only great for an outdoor garden space but also a pool area! The Garden Sofa is also a perfect choice for your outdoor livingroom! The internal framework of the furniture is thoughtful and well-done. See the aluminum feet protectors in the image above - you can position your furniture any which way without any worries of damaging your lawn or patio area. The framework used inside is made out of powder coated aluminum which will also prevent rust. 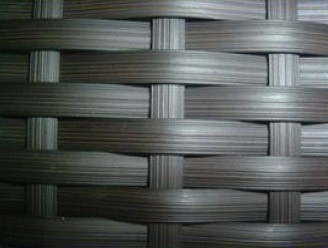 All of their synthetic PU rattan pieces do not fade or crack and will look great year after year! 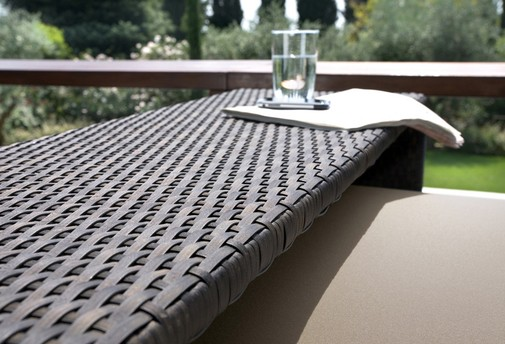 The PU Rattan is so durable that it remains soft and cool to the touch and will not overheat on long hot summer days! It requires very little maintenance as well. A simple wipe down will do! 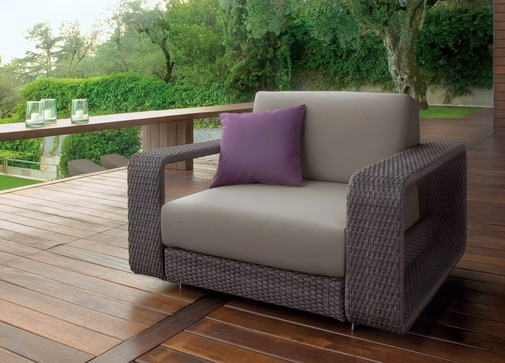 I love the sleek lines of the Barbados Rattan. The cream coloured Teflon cushions are well made, thick for comfiness and resistant to moisture. So have your wine party as they are easy to clean and care for! Any spillages can be easily wiped off. Depending on your design, there are many color options available. Besides great versatility, function, and sleek design, Luxury Patio Furniture company has some quality furniture options to bring contemporary style to your outdoor living space which can be enjoyed for years to come! 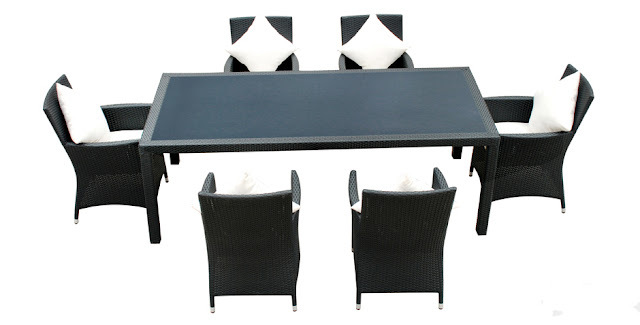 To order your very own Luxury Patio Furniture set, contact them on their WEBSITE, FACEBOOK, TWITTER. BIG thanks to Luxury Patio Furniture for the interview, and becoming one of my sponsors!!! See their advertisment on my side-bar.